Are business cards still necessary? When people want to contact us, most will look us up online or check their electronic address book. It's true that business cards (and the Rolodexes to house them in) are no longer the best way to organize contact information. However, business cards still work as marketing tools. They're inexpensive and portable. And handing someone a physical item - even a simple card - is more personal than saying, "Visit my website." Business cards do have their limitations. Within a small space, you can't include as much information as on your website or on a tips sheet. But the amount of information is not that important. You can always add a web URL for people to find out more. As a marketing tool, the purpose of a business card is to arouse curiosity and interest, so that people will hold onto your card and will want to follow up. By mail - The most efficient way to distribute hundreds of cards in a short time is to drop off or send stacks of them to your local referral sources - physicians, attorneys, agencies, clubs, etc. But don't be surprised if you get few or no referrals as a result - especially if you are in the early stages of developing cross-referral relationships. 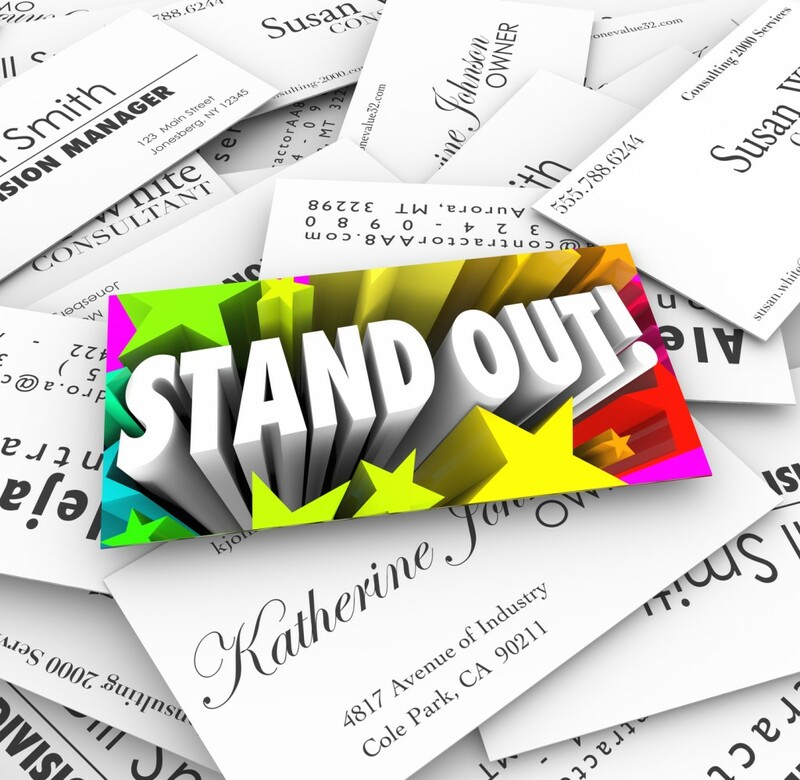 Business cards themselves have little value unless a recipient associates them with other information about you, such as personal acquaintance, reputation, or useful and relevant communication. You can help create such an association by clipping your business card to other correspondence. For example, if you come across an article or news item that might be of interest to a non-competing colleague, print it out and send it, with your business card attached. When your patients give you permission to send progress updates to their physicians, clip a couple of business cards to the letter. If you send documents to attorneys, include your business card. The more you do this over time, the more your name will become familiar to those who work with people who need your services, and the more likely they will think of you when it's time to make a referral. 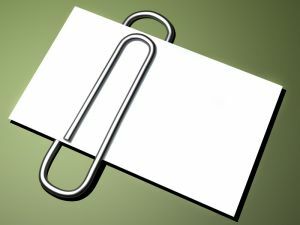 Hint: When enclosing your business card with other papers, always clip or staple it to the correspondence. If you just toss your card into the envelope it might not reach the person it's intended for, particularly if the office mail is opened and sorted by an assistant. 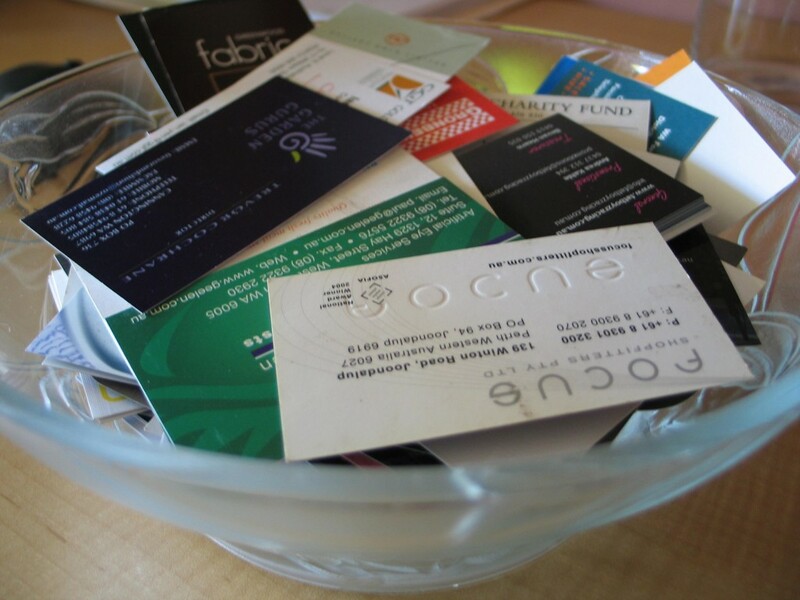 In person - Networking events are not the only places to hand out a business card. Use your card in everyday situations to jot down information that you want to share with someone - for example, a website, a referral name, a book title, your cell phone number. Because of the added hand-written information, the other person is more likely to hold onto your card. Drop your business card into fishbowl drawings sponsored by local companies. There's only a small chance that you'll win, but that's not the point. They will probably add you to their mailing list - which is not necessarily a bad thing, if you regard it as an opportunity to strengthen your connections with other businesses. The more people you know in your community, the greater your chances of getting new referrals. You have the competence to help various people with several types of problems, but don't try to cram all that information onto one card. First of all, it would look very cluttered. Second, it would be distracting for those who are looking for a specific type of help. Instead of (or in addition to) having one generic business card, create a few different cards, each with content tailored to the types of people seen by a given referral source. Thus, the card you give to cardiologists might emphasize stress management, while the card you give to pediatricians would highlight something else, such as child behavior management or academic testing. If you help people with sleep disorders, this might be a good topic to list on the business card that you give to financial planners and divorce attorneys. The possibilities are endless. Just be sure that you are professionally qualified for any specialty that you list on a business card. If you wrote a book, you will likely be giving talks and workshops related to the content. Make a business card just for that book, showing a cover image, along with the website where the book is sold, and a few words about the book's general message. If you're interested in doing more public speaking, make a business card with an engaging description and/or list of of topics that you can talk about. Be sure to include your head shot photo and a website URL, where organizers and others can learn more about your expertise and speaking style. Your current patients and clients are some of the best word-of-mouth referral sources. To encourage them to take your business card without putting pressure on them, make your cards available in the waiting room, with a sign next to them: "Take one." Those two words will increase the likelihood that people will take a card - and maybe pass it on to a friend or family member. If your card stands out, it will invite comments from people when you hand it to them - which gives you a chance to continue the conversation. Here are some clever examples, obviously designed by professionals. You don't need to go that far in order to have your card noticed. Simple tweaks such as a dark background (vs the typical white or beige) or an attractive logo can make your card look different. Shiny coatings get noticed, although they are difficult to write on - so leave the back uncoated if you go this route. The texture of your card can differentiate it as well. Embossed lettering feels different, which encourages people to look at the card as they hold it. Print from your computer - Using business card template software and business card stock (available at office supply stores) you can try different layouts and colors. Once your business card is set up in your computer you can print as many as you like - no minimum. And you can change it as often as you like. This is an inexpensive way to print small quantities of different cards for different audiences. Online print and design services - Vistaprint, iPrint, Zazzle, Canva and other online services have hundreds of templates for you to design your business card online. You can upload your own images as well. These business cards cost more than home printing (unless you order large quantities), but the print is usually crisper and brighter. Using a print service is a must if you want coated or embossed cards. Prices vary, and the companies frequently offer discounts and specials. Before you order, search online for promo codes or coupon codes. What's your experience with business cards? Have you found a good printing source? What kind of results have you seen with your business card? Please leave a comment below.